Doctor Who, a timelord from the long-running BBC science fiction television program, is having time problems of his own on KUED Channel 7. Beginning May 7, the program Doctor Who will be rescheduled from its daily 5:30 p.m. air time to Saturday at 10:30 p.m. Doctor Who, the longest running science fiction show on earth, is formated in half-hour segments with each of the Doctor's adventures serialized into several segments. Changing the program to a two-hour program on Saturday evenings will allow KUED to show an entire adventure at one sitting, Kirk Groeneveld, an associate programming manager said. The planned schedule change is also based on the declining number of pledges from viewers. Dawn Aoki, KUED's membership manager, said pledges from Doctor Who fans have been decreasing steadily for the last two years. 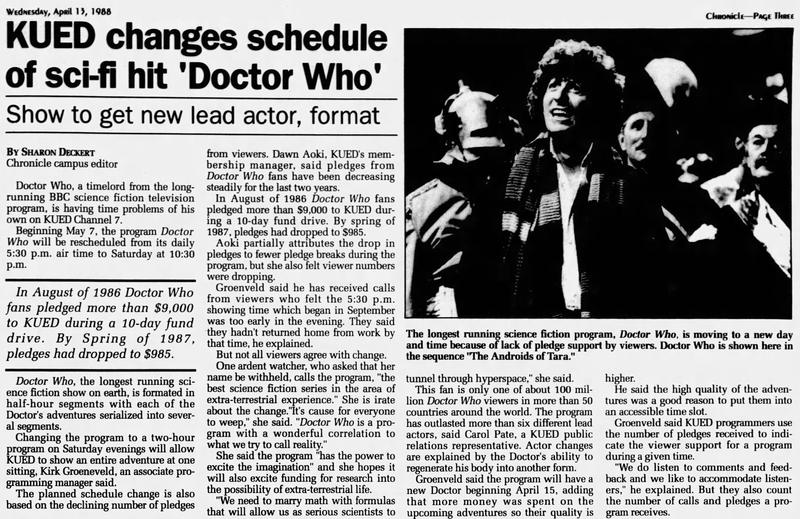 In August of 1986 Doctor Who fans pledged more than $9,000 to KUED during a 10-day fund drive. By spring of 1987, pledges had dropped to $985. Aoki partially attributes the drop in pledges to fewer pledge breaks during the program, but she also felt viewer numbers were dropping. Groenveld said he has received calls from viewers who felt the 5:30 p.m. showing time which began in September was too early in the evening. They said they hadn't returned home from work by that time, he explained. But not all viewers agree with change. One ardent watcher, who asked that her name be withheld, calls the program, "the best science fiction series in the area of extra-terrestrial experience." She is irate about the change. "It's cause for everyone to weep," she said. "Doctor Who is a program with a wonderful correlation to what we try to call reality." She said the program "has the power to excite the imagination" and she hopes it will also excite funding for research into the possibility of extra-terrestrial life. "We need to many math with formulas that will allow us as serious scientists to tunnel through hyperspace," she said. This fan is only one of about 100 million Doctor Who viewers in more than 50 countries around the world. The program has outlasted more than six different lead actors, said Carol Pate, a KUED public relations representative. Actor changes are explained by the Doctor's ability to regenerate his body into another form. Groenveld said the program will have a new Doctor beginning April 15, adding that more money was spent on the upcoming adventures so their quality is higher. He said the high quality of the adventures was a good reason to put them into an accessible time slot. Groenveld said KUED programmers use the number of pledges received to indicate the viewer support for a program during a given time. "We do listen to comments and feedback and we like to accommodate listeners," he explained. But they also count the number of calls and pledges a program receives. Caption: The longest running science fiction program, Doctor Who, is moving to a new day and time because of lack of pledge support by viewers. Doctor Who is shown here in the sequence "The Androids of Tara." APA 6th ed. : Deckert, Sharon (1988-04-13). KUED changes schedule of sci-fi hit 'Doctor Who'. The Daily Utah Chronicle p. 3. MLA 7th ed. : Deckert, Sharon. "KUED changes schedule of sci-fi hit 'Doctor Who'." The Daily Utah Chronicle [add city] 1988-04-13, 3. Print. Turabian: Deckert, Sharon. "KUED changes schedule of sci-fi hit 'Doctor Who'." The Daily Utah Chronicle, 1988-04-13, section, 3 edition. This page was last modified on 29 March 2019, at 03:00.